The download page may look alarming (there’s hardly anything on it), but this free, portable tool – now updated to work in Windows 10 – is actually very sophisticated. 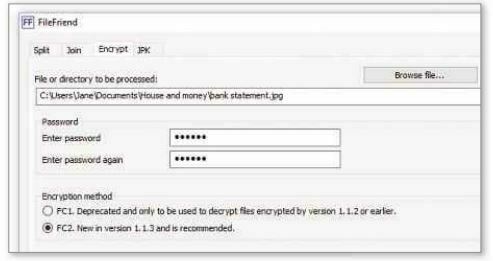 FileFriend lets you encrypt and password-protect any file or folder on your PC – very useful for scanned bank statements, licence numbers and other sensitive information. You can also hide documents inside JPEG photo files, and ‘split’ files into up to 1,000 tiny pieces, so they’re of no use to anyone until you ‘join’ them again with one click. This may sound very complicated, but the program is very easy to use and comes with its own Help guide, should you need it.